The Genie Community Group is a small, not-for-profit organisation with a written constitution. For a brief summary of the purpose and benefits of Genie and the people involved, see below for a short PowerPoint presentation. Or click here to download a copy. Any resident in the Goring Gap is welcome to join the group in support of its aims to help develop the Genie range of free, useful community newsletters and their distribution. Other members of the group compile and edit the various newsletters, help on the technical and production side and manage the correspondence and website. Each newsletter has its own editor, who passes the completed document to the administrators to be emailed out. Only the administrators have access to the email database. The editorial content of Genie newsletters is relevant to the villages in or near the Goring Gap. 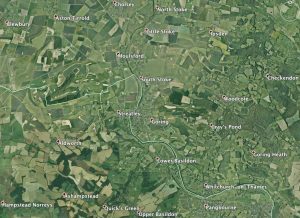 The location of many of the communities in the Genie area are shown in the Google Earth map below, which are roughly within a 5 mile radius of Goring-on-Thames.